Futurist David Houle and educational strategist Jeff Cobb issue a “call to action” to everyone who is concerned about education in America. The book begins with a helpful background on the roots of American education, the current landscape, and the forces that are driving transformation. This background supports the author’s case that reinventing our system is inevitable and we already have the information and capabilities to make the necessary changes. Shift Ed challenges us to ask the right questions, expand our vision, and take action now. America needs a new educational vision. 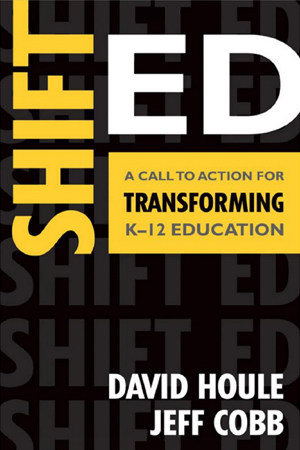 Shift Ed provides a clear vision that emphasizes the essential ingredients of a 21st-century education based upon creativity, collaboration, and critical thinking. Houle and Cobb make a great case that nothing less than transformation will be enough. An an educator, I highly recommend this book on the transformation of K-12 education. Old ways, repeating the past, and no change are hallmarks of a broken system. Shift Ed outlines the case for building a new system of K-12 education. Shift Ed’s major strength is awakening Americans, especially the educational community, to the reality that change is here. We must prepare our young scholars for a global society, as opposed to past teaching and learning practices.